Keep current with Saucon – our people, innovations, solutions and our diverse operations. Read the latest news releases and find out where our technologies and creative problem solving are making surprising new connections in the bus transportation industry. Pictured below is our proud customer across the pond, Stagecoach London, accepting the Gold Innovation Champion award. Andy Hammant and Rob Crispin with CEO, Martin Griffiths of Stagecoach, and Andy and Rob with Paul Lynch, London MD. 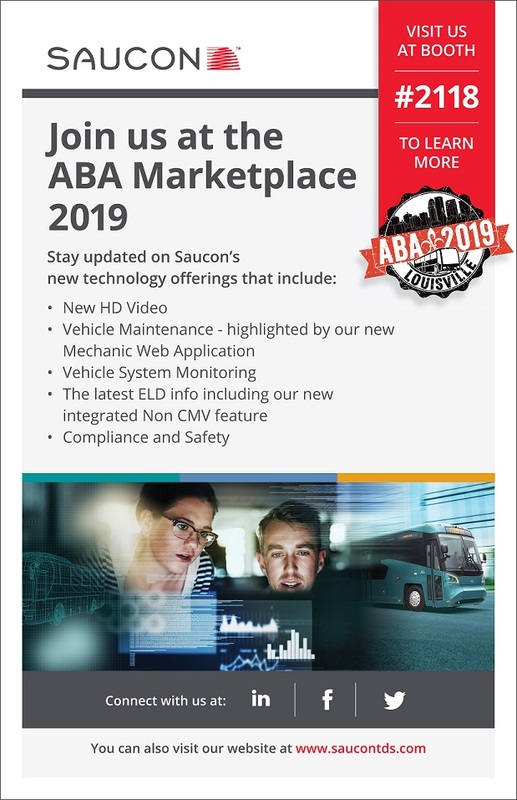 We at Saucon are honored to be their telematics technology to monitor the health of Cummins engine data as mentioned in their achievement of this award! "Back in the UK, Andy and Rob have worked with the system provider for 18 months to really polish the information. No-one else in the UK is looking at this, so they are real pioneers into the world of telematics. This involves a lot of data crunching and sifting through engine health alerts to determine where to focus attention." BETHLEHEM, Pa., Jan. 7, 2019 /PRNewswire/ -- Saucon Technologies today announced the delivery of a remote, telematics-based connectivity suite designed to maximize uptime and improve the reliability and performance of compatible Cummins engines. 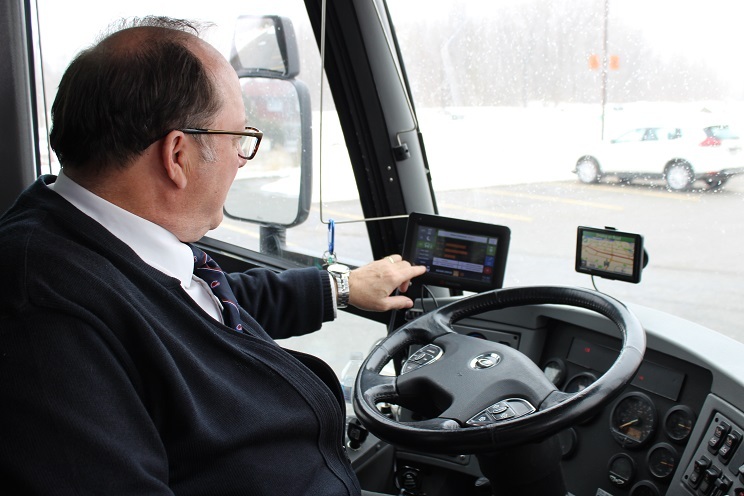 The two companies have been working collaboratively to integrate and deliver Saucon's innovative telematics infrastructure with Cummins' Connected Advisor and Connected Software Updates, to introduce a new approach to predictive fleet management. Cummins' Connected Advisor can provide prioritized, time-based recommendations to help fleet managers distinguish between immediate repair needs and those that can be scheduled a few days out. Fault reports, including suggested root causes and recommended actions, are sent to fleet managers daily to help initiate the repair process. For faults requiring prompt attention, immediate notifications are provided instantly so fleet managers can make informed decisions when their equipment is in the field. Cummins' Connected Software Updates installs a key technical requirement to enable Cummins upcoming over-the-air programming (OTAP) suite, including the current feature to update engine control modules through cellular or WiFi connectivity within a matter of minutes. Fleet managers are notified of software updates available for their compatible engines via a web-based portal. The online interface empowers fleet managers to update an individual engine or scale update deployments across multiple vehicles, with the option to pre-approve updates to automatically install upon release from Cummins. "Connected software updates keep Cummins equipment in the field longer," said Director of Digital Solutions at Cummins, Todd Mysak. "Our new wireless solution takes about five minutes to calibrate a vehicle's ECM remotely, enabling customers to keep their engines running at peak performance while reducing service costs and downtime. The collaboration between Saucon Technologies and Cummins has been beneficial on many levels." "Saucon Technologies continuously strives to provide additional value for our customers," said CEO of Saucon Technologies, Bill French. "Through our work with Cummins, we can now jointly deliver actionable information, predictive maintenance and remote software updates that can optimize uptime and performance for their engines." Cummins Inc., a global power leader, is a corporation of complementary business segments that design, manufacture, distribute and service a broad portfolio of power solutions. The company's products range from diesel and natural gas engines to hybrid and electric platforms, as well as related technologies, including battery systems, fuel systems, controls, air handling, filtration, emission solutions and electrical power generation systems. Headquartered in Columbus, Indiana (U.S.A.), since its founding in 1919, Cummins currently employs approximately 58,600 people committed to powering a more prosperous world. Cummins serves customers in about 190 countries and territories through a network of some 500 company-owned and independent distributor locations and approximately 7,500 dealer locations. Cummins earned $1 billion on sales of $20.4 billion in 2017. Press releases can be found on the Web at https://www.cummins.com/. Follow Cummins on Twitter at https://www.twitter.com/cummins and on YouTube at https://www.youtube.com/cumminsinc. Saucon Technologies is a leading telematics provider for the passenger transportation industry. Headquartered in Bethlehem, Pennsylvania (U.S.A.), Saucon Technologies serves over 500 transportation clients in North America and the United Kingdom. With over 10,000 buses on the road utilizing the Saucon TDS solution, Saucon is committed to developing and delivering cost-effective and efficient solutions that dramatically improve asset management, and the overall customer experience. For more information, please visit https://www.saucontds.com. Follow Saucon on Facebook at https://www.facebook.com/SauconTech/, LinkedIn at https://www.linkedin.com/company/saucon-technologies/, and Twitter at https://www.twitter.com/SauconIoT . Installing Electronic Logging Devices required by new federal rules has created some headaches for operators. A recent UMA survey, completed by 53 respondents, indicated 85 percent had compatibility issues with their coaches. Complaints have ranged from screen failure to engine malfunctions, and 40 percent of those surveyed said they wouldn’t purchase the same product. UMA addressed this hot topic at its first round of regional town halls by bringing in experts to answer operators’ questions. 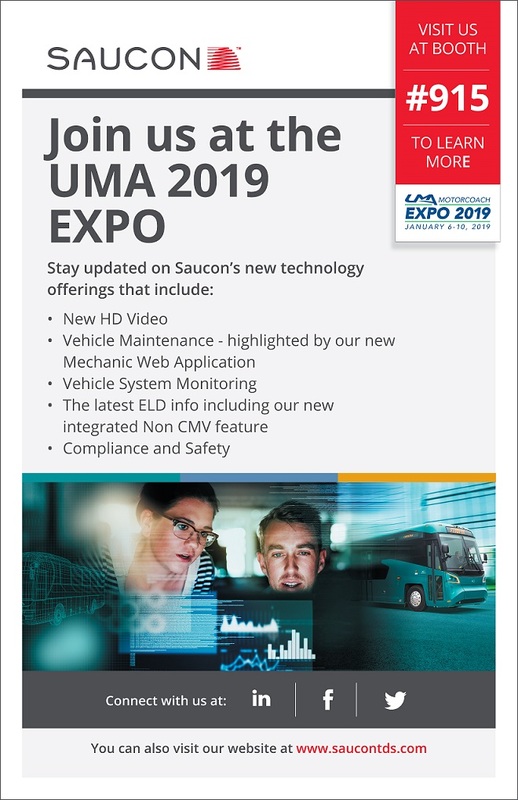 The call featured a panel of representatives from bus manufacturers ABC/Van Hool, Prevost and Motor Coach Industries; and ELD device makers Saucon and UBT. Device makers and manufacturers offered advice on steps to take to either prevent or resolve issues, some of which is summarized here. Intelligent transportation management platform is adding Allison diagnostic codes to its suite of cloud-based software, hardware and analytics tools. INDIANAPOLIS – October 1, 2018 – Allison Transmission has collaborated with Saucon Technologies, a leading provider of technology solutions for the passenger transportation industry, to deliver transmission health information to motorcoach, public transit, and school bus fleets. Transmission health information can include prognostics to monitor various operating parameters, oil and filter life and diagnostic transmission information. This partnership is part of an ongoing journey to provide fleets with actionable information to support their fourth- and fifth-generation Allison transmissions that are already in service. “We are pleased to partner with Saucon Technologies as they extend new capabilities and value to existing customer fleets. We look forward to working with Saucon and seeing the great results that we can accomplish together,” said John Coll, senior vice president, global marketing, sales and service with Allison Transmission. Saucon’s intelligent transportation management platform provides a full suite of cloud-based software, hardware and analytics tools designed for the passenger transportation industry. From GPS fleet tracking and onboard video to remote engine diagnostics, the company’s Internet of Things - enabled solutions saves clients time and money. Fleets interested in enabling these capabilities should contact their Saucon Technologies sales representative. “Teaming with Allison, a premier transmission manufacturer has been an extremely productive and rewarding collaboration. Our goal at Saucon is to be able to provide as much data from as many onboard systems as possible, in near real-time. This allows our customers to manage the overall health of their vehicles through the use of our Cloud-based Portal. Allison’s expertise, in regards to their transmissions, turns the data into actionable intelligence, which can lower maintenance costs, reduce downtime and deliver improved vehicle performance. We look forward to future innovation and growing our relationship with the Allison team,” Rich Shelley, Saucon executive vice president, sales and marketing. Allison is committed to powering the global connected vehicle ecosystem with telematics system providers, fleet-management software providers, and original equipment manufacturers to support existing and new customers with connected capabilities. Support for additional vocations and global regions is planned. Allison Transmission (NYSE: ALSN) is the world's largest manufacturer of fully automatic transmissions for medium- and heavy-duty commercial vehicles, and is a leader in electric hybrid-propulsion systems for city buses. Allison transmissions are used in a variety of applications including refuse, construction, fire, distribution, bus, motorhomes, defense and energy. Founded in 1915, the company is headquartered in Indianapolis, Indiana, USA and employs approximately 2,700 people worldwide. With a market presence in more than 80 countries, Allison has regional headquarters in the Netherlands, China and Brazil with manufacturing facilities in the U.S., Hungary and India. Allison also has approximately 1,400 independent distributor and dealer locations worldwide. For more information, visit https://www.allisontransmission.com. Saucon Technologies is pleased to announce that it has received a 100% compliance verification of its ELD product from an independent third party. Saucon Technologies contracted PIT Group (FPInnovations), a neutral testing, research, and engineering group for the North American transportation industry, to independently evaluate and verify that its ELD product was 100% compliant with FMCSA regulations. PIT Group’s rigorous tests were conducted in accordance with the test plans and procedures issued by the Federal Motor Carrier Safety Administration and included in the final ELD regulations. The tests included lab and bench testing, as well as a road test conducted on a motorcoach. Saucon would like to thank Coach USA and Coach Canada for their support in this certification process, and their donation of a coach and driver used during the road test portion. It is representative of their continued commitment to industry safety and compliance. Based in Montreal and active throughout Canada and the United States, PIT Group is a division of FPInnovations. Founded in 2008, this neutral and objective organization helps the manufacturers evaluate and refine their prototypes, and the fleet managers to choose the best technologies to reduce costs and environmental impacts. The group is made of engineers, technicians, eco-driving instructors and fleet management specialists who promote energy efficiency within the commercial and municipal transportation and public transit industries everywhere in North America. Its highly qualified team uses cutting-edge processes and equipment within each Energotest campaign, a fully independent road test laboratory that is ISO 17025 certified and benefits from international credibility. For more details, visit http://www.thepitgroup.com. This document is meant to prepare customers for the ELD enforcement. It details what motor carriers need to know, and how to avoid being written out of service for ELD related issues. BETHLEHEM, Pa. (Feb. 17, 2017) - Saucon Technologies, provider of a broad range of solutions to reduce risk and improve operational effciency in the transportation industry, is pleased to announce, Coach USA, a leader in the MotorCoach Industry, has selected Saucon Technologies to be its ELD Provider. "We're excited to add our ELD solution to the suite of products we provide to Coach USA," said Bill French, CEO - Saucon Technologies. "Our partnership with Coach USA provides many opportunities for innovation, and this is yet another example of their commitment to safety." "We are thrilled to work with Saucon Technologies on this product. Through Saucon’s leadership in the industry, we are con dent that we can remain compli- ant with the Federal regulations as they evolve," added Sean Hughes, Director Of Corporate A airs, Coach USA North America. Coach USA is one of the largest transportation companies in North America, and maintains the highest safety compliance rating (Satisfactory) from the US Department of Transportation’s Federal Motor Carrier Safety Administration. Paramus, N.J.-based Coach USA owns and operates 25 local companies in North America, some that have been in business for more than 70 years, which operate scheduled bus routes, motor coach tours, charters and sightseeing tours. Visit their website for more information. Bethlehem, Pa. (Jan. 28, 2016) - Saucon Technologies, provider of a broad range of solutions to reduce risk and improve operational efficiency in the transportation industry, and Cummins Inc. (NYSE: CMI), a leading independent manufacturer of diesel and natural gas engines, controls and emission solutions, announced today that Cummins Connected Diagnostics application is now available to customers using Saucon’s CAN Do solution.